Christ, could the Atlanta Braves get any more annoying? 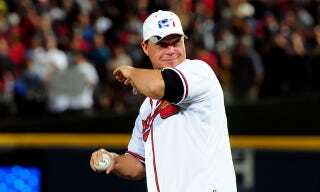 Baseball's fun police reportedly added another name to their "People Who Don't Respect The Game And/Or The Atlanta Braves And All That They Stand For" list, and that name happens to belong to Braves legend Chipper Jones. According to CBS New York, no Braves player volunteered to catch Jones's ceremonial first pitch before Game 1 of the NLDS because Jones had previously picked the Dodgers to win the series. So Jones had to throw his pitch to the team's mascot, who we now assume has been tarred and feathered for not showing solidarity with his brothers in arms. You know a baseball team has reached peak insufferability when it turns Chipper Jones into a sympathetic character. We'd say that we are glad that Juan Uribe sent this team of ninnies home for the season, if not for that fact that Brian McCann will surely spend his offseason haranguing neighborhood children for not having properly shined shoes.